Today's date there are so many desserts. Every day people are making innovation in different recipes and invent new recipes. Take this example of banana from it so much variety of food items can be made. It can be used in sweet dishes as well as spicy dishes too. 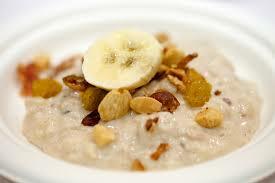 We heard about rice pudding but it is possible to make rice pudding with the banana? We definitely make this banana rice pudding. How? Let's see the recipe how to make it. It's as simple as that of plain rice pudding, only innovation is that we are adding bananas into that. 1. Take a pan pour ghee into it put it on the flame. 2. Heat up the ghee, when it gets heated, put raisins and cashew nuts into it. 3. Roast it very well. Now raisins get puffed and cashew nuts become crispy now. 4. Take it out from the pan. 5. In to that pan now roast the rice very well for about 5 to 7 minutes. 6. Put this also aside. 7. In a large pan now boil the milk when it takes out one boil put roasted rice into it. 8. Now boil the milk continuously till it becomes half in quantity. 9. During boiling stir it continuously. 10. Now put jaggery and cardamom powder into it, Mix it well. 11. Now put finely chopped bananas into it. Mix it well again. 12. After 5 minutes, put some roasted raisins and cashew nuts into it put some of them for garnishing. 13. Now switch off the flame let cool down it. 14. Put it in the fridge for half an hour. 15. Now take it into the serving bowl. 16. Garnish it with the remained dry fruits. and serve it.